As approved by the National Heraldry Committee on the 11th of July, 2002, the Coat of arms of Jelgava depicts elk head on crimson red background, wearing the Small National Emblem. Usually a city acquires coat of arms together with its city rights. Historical sources show that Jelgava received its rights of the city in 1573, yet the first reference to the coat of arms is found in document from 1574 – a record in city treasurer’s book about payment to journeyman Hans for carving the city stamp. Yet the first known coat of arms appeared later – in 1576, when Duke Gotthard Kettler gave a coat of arms to his residence – Jelgava. As far back as 1565 the king of Poland Sigismund August had given the Duke a coat of arms, in which lion represented Courland and elk – Zemgale. 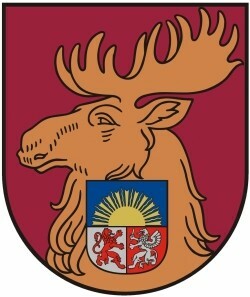 In the course of time elk was transferred to the coat of arms of Jelgava. “Elk is not a common animal in heraldry of Europe; sometimes it is mixed with stag. The coat of arms of the Duchy of Courland and Zemgale depicts a stag with thin antlers, yet an elk has broad antlers. Moreover, written sources from 1579 mention Polish king Stefan Batory, who acknowledges additions to the coat of arms by assigning diploma and noting that the biggest part of the coat of arms is “the front part of elk”. Thus, later depictions of stag are mere negligence of artists,” argues researcher of the history of heraldry Imants Lancmanis. Stefan Batory then added several elements – pothook (figure of the dynasty of Kettlers) that encompasses wolf’s chop (element from the coat of arms of the Polish king Stefan Batory) and monogram of the second Polish king – Sigismund August; it was done to stress the fact that Duchy of Courland and Zemgale is part of Poland. These three elements formed a shield on elk’s chest; this shield later changed with every political shift (for instance, when Ernst Johan Biron came to power, the shield disappeared and instead of it one could identify a tree stump with a sitting bird on it and crossed keys in front). In 1846 the coat of arms of Jelgava, being designed as in the times of the dynasty of Kettlers (elk’s head on purple background, with a shield on chest) was accepted by the Russian tsar Nicholas II and was included in the universal register of Russia. After many discussions (whether elk or stag should be depicted), on October 31, 1925 the president of the Republic of Latvia Jānis Čakste approved the coat of arms of Jelgava: “Stag’s head on red background, with a small state emblem on his neck”. In Soviet times the animal was now and then referred to as elk and background was changed frequently; in the years of National awakening the coat of arms with stag was approved again.